Paperback:326 Publisher: Create Space Published: June 25, 2010 ISBN#: 9781452871264 About The Book: The Book consists of 6 short stories and 2 novellas. Here are brief descriptions of each story. 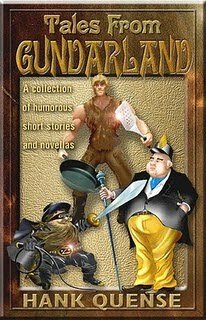 Gunderland: Gundarland is populated by humans, dwarfs, elves and other races; it's the backdrop for unique adventures, brilliant heroes and cunning villains. Romeo and Juliet: Romeo, a dwarf miner, and Juliet, the elfin daughter of a rich gem merchant, have a rocky courtship because Juliet's brothers are avowed enemies of Romeo's family. Chasing Dreams: This novella tells the story of twin yuk brothers on their journey from strong-armed thugs to highway robbers to bawdy house owners to politicians. The brothers are plagued and harassed by vigilantes. Boggerts Blue: A warrior-cook seeks to rescue a kidnapped princess. She refuses to be rescued by someone who isn't noble-born. The Big Bang: A wizard has to eliminate a dragon and his minions. Along the way to complete his mission, he is tested by a shape-changer and a pair of trolls. The Queen's Hero: This novella is about a young tinker-warrior as he struggles to save his Queen from a pirate admiral trying to overthrow her and become king. The Queen's three beautiful daughters have their own plans for the young hero. Merchant of Venison: A dwarf butcher borrows money to help his best friend and soon regrets it. The dwelf money lender has bloody ideas about the default payments. Inter-Racial Musical Playoffs: A few greedy wizards attempt to fix a musical competition. Other wizards try to protect the band leader who is favored to win the competition. Tactical Surprise: A general develops unusual tactics to defeat a rebel army. The enemy leader is a close family friend making the generals decisions more difficult. (Descriptions from Amazon.com) My Thoughts: The idea of this book was unique and creative. The book starts up with the introduction to "Gunderland". Planet Gunder was created accidentally by an omniscient god who sneezed after snorting his favourite recreational powder. The "effects" of the sneezing is what created their universe, Scientists called it "The Big Achoo". I haven't read anything like this before, it was refreshing to read takes on classic stories with a fun twist to them. My favourites were "Gunderland", "Romeo & Juliet" and "The Queens Hero", the others I could have done without. Overall I thought the book was creative and different but I just didn't care much for the other stories. "Chasing Dreams" part 1 was entertaining, Zorro has always been a favourite tale of mine and I loved Hank Quenses' twist on it, but when it came to part two it was a struggle to finish, the language of the yuks was irritating and distracting to me, and the story just wasn't capturing my attention. It was slowing me down and it was preventing me from wanting to pick the book up again. There was nothing particularly wrong with the remaining stories, they just weren't my taste. I am glad I read this book because I did find most of it funny and entertaining. It is a great book to read in between book's or on the beach. I think this is why I prefer novels to short story collections. With a few exceptions, I have a hard time finding an anthology where I like or dislike everything in it so I find them pretty tough to review. I like how you gave a brief synopsis of each tale, though.